HÀ NỘI — Shares advanced for a fourth session on the HCM Stock Exchange thanks to the advancement of banks, property developers and other large-cap stocks. The benchmark VN Index added 1.10 per cent to close yesterday at 859.70 points. It has gained total 3.2 per cent in the last four sessions. The benchmark index also hit its highest level since February 2008. More than 171.6 million shares were traded on the southern bourse, worth roughly VNĐ5.1 trillion (US$226.5 million). The trading figures were down about 70 per cent in volume and 75 per cent in value compared to Tuesday’s numbers. Trading condition was balanced, with 144 gaining stocks, 125 declining ones and 53 shares closing flat. Shares of real estate firms and banks played the main role in driving the market up yesterday. Five of the seven listed banks on the southern exchange advanced, including Bank for Investment and Development of Việt Nam (BID) and Vietcombank (VCB). Those five bank stocks rose between 1.8 per cent and 4.2 per cent. The property development sector was boosted by Vingroup (VIC), which jumped 5.6 per cent, extending its rally for a ninth session with total growth of 18.4 per cent. Other real estate shares that made gains included Đất Xanh Real Estate Service and Construction (DXG) and Phát Đạt Real Estate Development (PDR). Large-cap stocks also performed well as the VN30 Index that contains the 30 largest shares by market capitalisation and trading liquidity gained 0.89 per cent to 853.57 points. Some gainers in the VN30 basket were IT group FPT Corp (FPT), PetroVietnam Gas (GAS), dairy producer Vinamilk (VNM) and digital retailer Mobile World (MWG). A strong increase of the VN Index yesterday with high trading liquidity proved much of investors’ attention was on large-cap stocks, Sài Gòn-Hà Nội Securities Company (SHS) said in its daily report. Given the fact that the number of gaining stocks was slightly bigger than that of declining ones, the cash flow began being diverged and investors were withdrawing from mid-cap and small-cap stocks, leaving heavy selling pressure on those stocks, to shift their focus on the large-cap group, the brokerage company said. 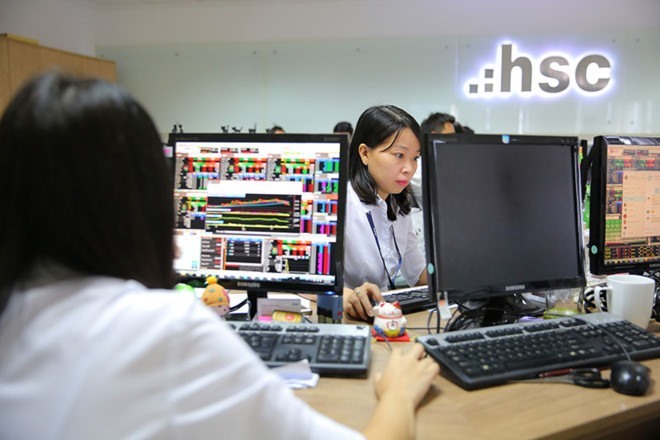 On the Hà Nội Stock Exchange, the HNX Index increased by 0.87 per cent to end at 105.74 points. It fell 0.25 per cent on Tuesday.